A few weeks ago we sent out one of our bi-monthly E-Newsletters with a request for stories written by our readers on the theme of The Family Dinner. The contest was inspired by The Family Dinner cookbook by Laurie David, a book full of not just delicious recipes but also (and we think even more importantly) full of great reasons to sit down and enjoy a home cooked meal with loved ones. The winning story would receive a signed copy of the cookbook for their kitchen library! We we're thrilled to receive a number of entries full of great stories–from fiction to memoir, some made us laugh, others made us teary and some inspired us to call our moms. So thanks to all you readers who entered for your inspired tales of how much dinner traditions can really mean. Here is the winning story! With more than a decade between the eldest and the youngest children in my family, growing up there were few things we held in common. On a regular day, there was only so much my older brothers could take hearing about my most recent boy band crush or school girl drama. Nor did I have much interest in their discussions of computers or the political matters that were beyond the understanding of a tween girl. On Sundays though, an hour or two before sunset, a transformation occurred in our home. The long table in our kitchen, whose job day to day was to hold mail and unfinished homework, as well as be a quick pit stop for filling empty bellies, shifted into something much more. Dressed nicely with linen placemats and napkins, the long table became the setting for a family ritual that somehow, in an almost magical way, quieted the differences between us just enough so we could share a meal and get to know each other. My father at the head of the table was generally a serious man, but became the jovial story-teller for the evening on Sundays. With every juicy steak he served up there was a cheesy joke as its side. He would recount stories from his younger years, or sometimes those of our grandparents’. No matter what the story, there was always a punch line, which would generally draw an exasperated sigh from our mother, signaling that perhaps this story was somewhat exaggerated for comedic effect. Sitting between our parents at either end of the table, my three older brothers and I would split time between our parents’ conversations and that of our own. I cannot even remember our specific conversations, whether it was music or sports or politics, but I know that we actually talked to each other, about something! And little by little, Sunday by Sunday, we became more than just siblings, we became friends–with each other and with our parents. The phrase “creature of habit” could very well have been invented in our family. Sunday Family Dinner’s menu every week was (is) steak, potatoes and salad. On occasion and by request only, my father would grill up some fish or burgers along with the steak. But the steak, potatoes and salad always remained the principal of the meal. It was the consistency, something comforting you could count on each week, that brought us back home no matter what and made Sunday Family Dinners a success. The four siblings are now split between two cities in two states, so Sunday Family Dinner goes to the town that Mom and Dad claim as home for the time. Over the years we’ve added spouses and nieces and nephews to the long table. My father repeats some of his stories from years ago and my mother finds herself forgetting which set of children she has already shared certain family updates with – do the Austin kids know this or was it the Fayetteville kids she told? But little by little, Sunday by Sunday, we continue to share our lives around a long table filled with simple good foods and friends. MCALLEN, Texas – Watermill Express, the nation’s largest drive-up pure drinking water and ice company, announced today the 20 winners of its annual writing contest. 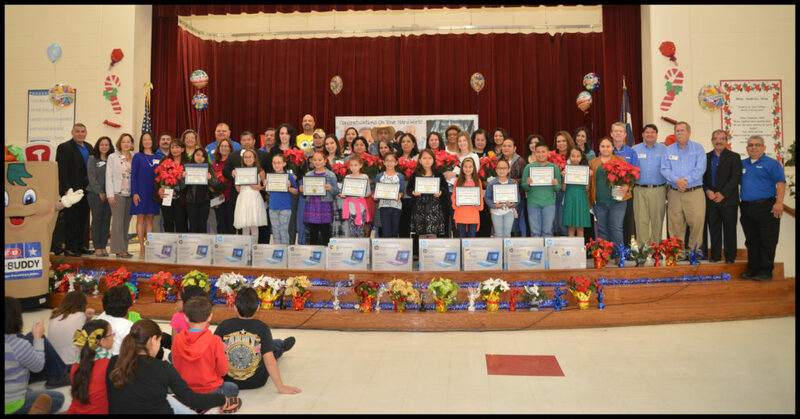 With the financial support of H-E-B, the fourth grade winners will each receive one laptop accompanied by a wireless printer as prizes for their essay submissions. Both teachers and parents of the fourth grade students will also receive H-E-B gift cards. 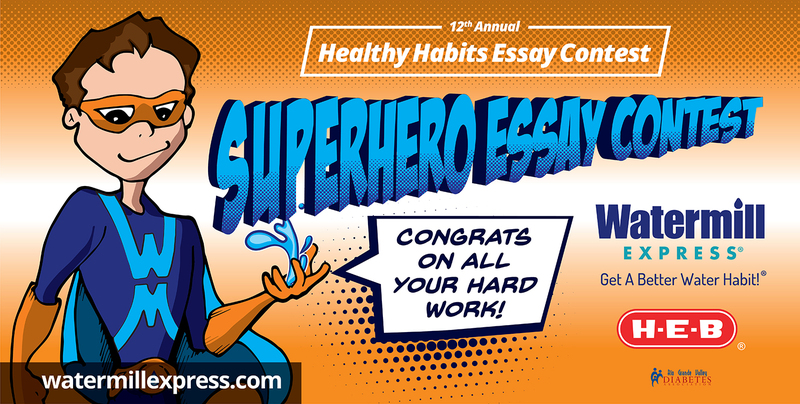 Themed, “Healthy Habits,” this year’s writing contest prompted students to reflect on the importance of making healthy choices and how to carry those habits with them for years to come. More than 1,000 essays poured in from fourth grade students in the McAllen, Hidalgo and Valley View Independent School Districts (ISD), the districts selected for this year’s contest. Judges, including Watermill Express’ co-founder and CEO Lani Dolifka, read and reviewed hundreds of essays in order to choose the most original and thought-provoking of the bunch. Award winners were selected from a total of 14 elementary schools in the Rio Grande Valley. Families and school staff are invited to attend ceremonies held in their district where the students will be recognized for their achievements. Exclusive to the Rio Grande Valley, the first Watermill Express writing contest was held in 2005 and has since awarded more than $77,000 in prizes and has logged more than 11,000 participating students. Its popularity among schools and families in the community has made it an annual event that many fourth graders hope to participate in. Watermill Express has a growing presence in the Rio Grande Valley with more than 200 locations and strong involvement in community events such as the recent “Pico de Gallo Century Bike Ride” and the “Break a Sweat Zumba-thon”. A community staple, the brand also partners with local organizations such as Make-A-Wish Foundation, Rio Grande Valley Diabetes Association, American Cancer Society and more. Plus, beyond its writing contest and community involvement, but equally as important, Watermill Express holds a strong commitment to giving back. Each year, Watermill Express pledges funds and thousands of gallons of water back to communities in the Rio Grande Valley and beyond. Across the country, Watermill Express serves thousands of customers a day safe, clean, pure drinking water and ice. Customers supply their own clean containers and drive up to the Watermill Express station to purchase great-tasting water and ice at a fraction of the price they would pay at the store. 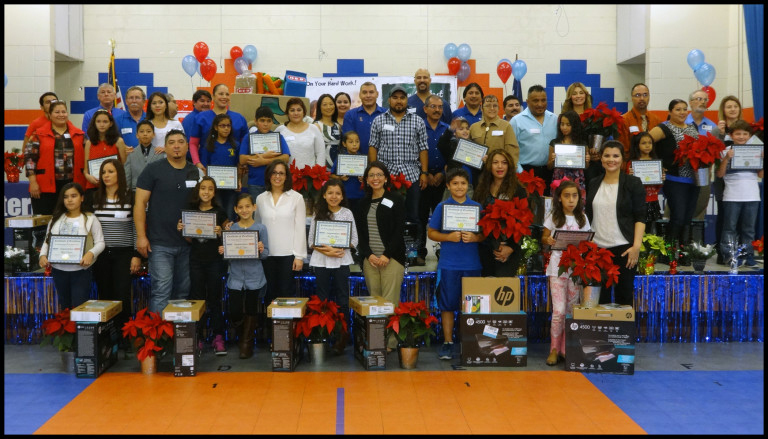 McALLEN, Texas – December 8th, 2015 – Watermill Express, the nation’s largest drive-up pure drinking water and ice company, along with H-E-B, presented new laptop computers along with wireless printers to each of the 15 winners of this year’s annual essay contest. This year’s entrants were 4th Grade students from the McAllen Independent School District. Over 1,200 essays were written and evaluated with 15 winners being selected. Winners were chosen based on original work submitted by the students on how creating healthy lifestyles one habit at a time can result in a healthy future. In addition to the students, the teachers of the winning students each received a $100 gift card and the winning schools received a Watermill Express health and fitness package.